The 2 nd Judicial District Court is slashing the number of grand juries impaneled each month in what it says is an effort to save money and move toward criminal justice best practices. The court is instead encouraging prosecutors to initiate new cases using preliminary hearings, which the district attorney says will make launching new criminal cases more challenging and resource intensive. Albuquerque Mayor Tim Keller also opposes the change, and police worry the system may mean officers are spending more time waiting in courtrooms and less time patrolling. But the chief public defender says he strongly supports the move and believes it will lead some cases to earlier resolutions. 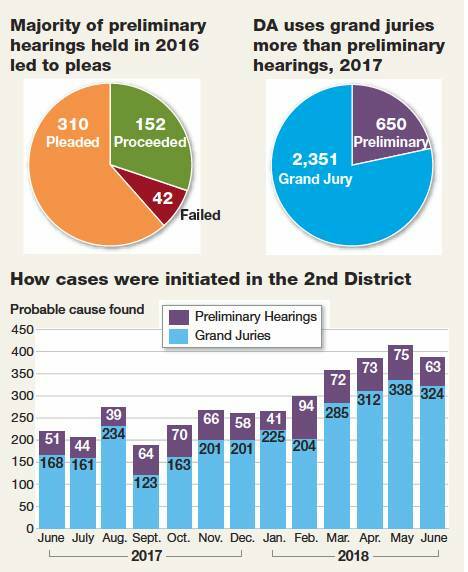 Most District Court cases are initiated in one of two ways: a grand jury proceeding before a group of citizens, or a preliminary hearing before a judge. The jury or judge then decides whether there is probable cause to support formal charges. In a grand jury hearing, the panel of citizens makes its determination based, in general, on the testimony of a primary case agent during a secret and relatively short proceeding. The defendant may or may not be present, and a defense attorney cannot attend. Substantially more witnesses - often including multiple law enforcement officers and the crime victim - testify in a preliminary hearing, which like a sort of minitrial, is open to the public and held before a judge. A defendant must be present and represented by an attorney who is allowed to question witnesses and present evidence. Prosecutors in Bernalillo County currently use grand juries to indict a vast majority of felony cases. In a news release announcing the change, the court says that, beginning Oct. 1, a grand jury panel will be available six days a month, down from five days a week, every week. In a letter sent to District Attorney Raúl Torrez on July 20, the court says it spent about $75,000 to conduct grand juries between July 1 and Dec. 31,2017, and those costs are on the rise. Jurors and their employers also incur costs, including lost wages and lost productivity. A report detailing the Legislative Finance Committee's review of Bernalillo County's criminal justice system cites the National Center for State Courts' recommendation that the District Attorney's Office consider ecuting more felony cases using preliminary hearings. Chief Judge Nan Nash said this week that such hearings mean a case is vetted at the front end, and a defendant will face only charges that a judge deems appropriate, which creates a more efficient system. Five of New Mexico's 13 judicial districts have done away with grand juries altogether, according to a news release announcing the change. And in her letter to Torrez, Nash wrote that two states have abolished the practice. Defense attorney Michael Stout said preliminary hearings offer far more protections to the accused, and because different systems are at work in different New Mexico judicial districts, a case is handled differently depending on where a person is arrested.
" The people in Deming essentially have more rights than the people in Albuquerque do," he said, pointing out that Deming no longer uses grand juries." Why should a prosecutor get to decide that you have fewer rights than the people in the next county? That has never made sense to me." Chief Public Defender Bennet Baur said the preliminary hearing also offers a chance for all sides to evaluate the strengths and weaknesses of a case early on. The LFC reported that 310 of the 504 felony preliminary hearings that took place in 2017 resulted in a plea during the hearing, meaning the case is essentially concluded. Baur said that's because all of the parties are in the same place at the same time. Although it's more work up front, he said, it will lead to earlier dismissals and guilty pleas when appropriate, sending fewer cases on a path to trial. It's a way, he said, to " clear the underbrush." " It allows us to, I think, spend more time looking at the serious cases later on," he said. But Torrez says preliminary hearings are more financially and administratively burdensome. Coordinating the appearance of a defendant and multiple witnesses is complicated, and if one person doesn't show up, the hearing must be rescheduled.
" When it happens, it does afford the possibility of an earlier resolution, so that is true. The problem is, what it doesn't account for is the extremely low rate at which cases actually get to that point," he said." So you resolve a much, much lower number of cases at the expense of not initiating substantially more." Torrez said that far more procedural hurdles are associated with preliminary hearings, and the system doesn't have the resources or personnel to channel more cases through that process. Currently, the cases that are routed through preliminary hearings are those involving lower-level charges and lower-risk defendants in cases with few witnesses. He says the stakes and penalties in violent cases are much higher, and it's rare that both parties are in a position to consider a plea agreement. Under the current system, Torrez said, the DA's Office can carefully schedule grand jury hearings to ensure that police officers, who often testify at these hearings, spend little time waiting. He worries this shift toward more preliminary hearings will mean more officers are waiting in courtroom hallways to testify in hearings that could ultimately be rescheduled.
" This is going to have a dramatic impact on ( the Albuquerque Police Department ) specifically and their ability to engage in community policing," he said." You have to take multiple officers off the street for hours at a time to attend a full evidentiary hearing, when they could be out in the community answering calls for service and responding to public safety needs." Nash said the court has proposed scheduling modifications that will let judges and lawyers determine whether a hearing will take place early in the day so that officers won't have to come to court when it isn't necessary. APD says it is aggressively recruiting new officers while shifting personnel schedules in order to let officers spend more time " engaged in community policing." " The more time officers spend in court, the less time they are out fighting crime," an APD spokesman said in a statement." We are aggressively recruiting more officers and we plan to shift to four, 10-hour days to allow officers to spend more time engaged in community policing. Any shift that requires additional time waiting in courtrooms will hurt those efforts and lead to more overtime costs." A spokeswoman for the mayor's office said Keller is drafting a response to the court to voice his support for the current grand jury system.
" This is a simple and effective way to help address the revolving door issue that has been severely hampering our city's crime fighting efforts," Keller said in a statement to the Journal earlier this week. Torrez said he is preparing a detailed response to the court's letter and ultimately may ask the Supreme Court to weigh in.